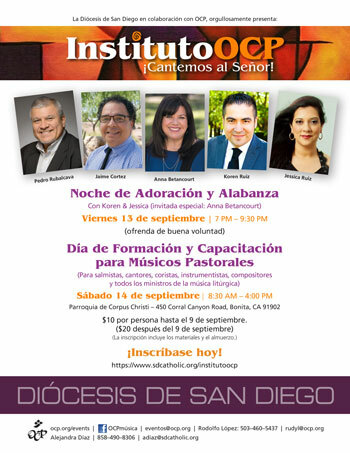 The Diocese of San Diego, in collaboration with OCP, proudly presents a day of training and formation for all liturgical music ministers (for cantors, choristers, instrumentalists and all who are part of music ministry). Featuring Pedro Rubalcava, Anna Betancourt, Rebecca Ramírez, and Rodolfo López. The Instituto OCP will be presented exclusively in Spanish. Music Selection for the Liturgy: How do I Begin?